As part of the CREDO Reference database, you now have access to Bloomberg QuickTakes, which are billed as “hard to explain topics, explained simply.” This is a great place to go to get a basic and reliable explanation of an issue. Here is an example of an explanation of Bitcoin. QuickTakes are not available on every topic; however, CREDO Reference itself has a great number of definitions and encyclopedic entries that can help you understand a topic. Ebrary is an online e-book database that offers access to a wide variety of topics including: anthropology, business, computers, education, English, fine arts, history, language, law, psychology, religion, science, and social sciences. The database offers the flexibility to browse by topic or search for a specific term. These e-books offer authoritative resources from trusted publishers, and allow you to access the full text of these books right from your home! Check out this New Reader Overview video to learn more! The library has purchased Chromebooks for the use of CURRENTLY registered ECC students (see this February blog post). Because we get so many questions about our Chromebooks, we have added several Chromebook FAQs to our library’s FAQ site. To find just the specific Chromebook questions, click on the Chromebook tag, or go to this link. If you have other questions, please contact the Circulation Desk at 847-214-7337 or circdesk@elgin.edu. 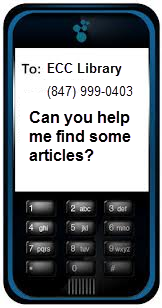 Did you know that you can text us when you have a question? This is a perfect solution when you need a quick answer or get stuck with your research. To text us, use the number 847-999-0403. This service is available only during our usual library hours. 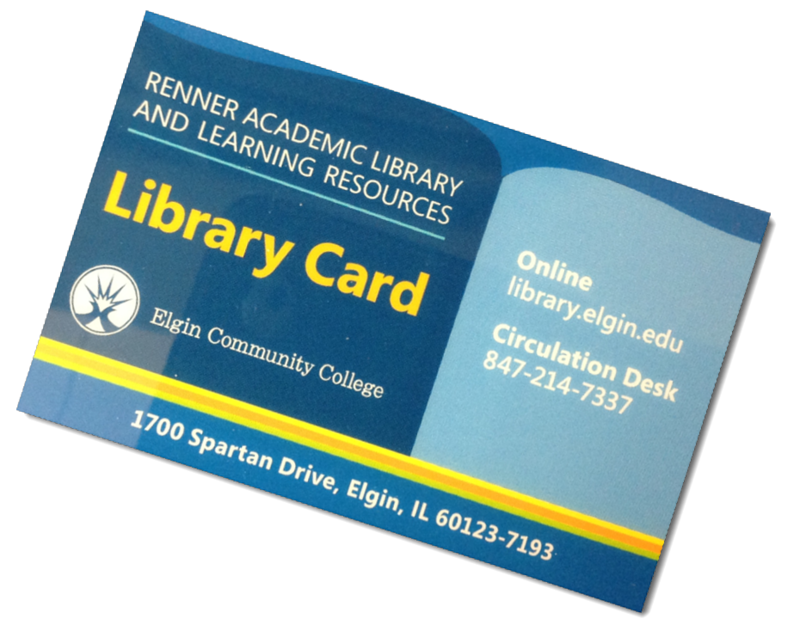 Check out the new library cards for staff and community members! This colorful card prominently features the library’s website and Circulation Desk phone number. All students and staff at ECC, as well as any high school age or older residents of our district (Community College District #509), are eligible for borrowing privileges. Students will need to present their ECC photo ID card at the Circulation Desk to have the library barcode activated. Community residents will need to present a photo ID with their current address. Student cards must be renewed each semester. Cards may be renewed by calling the circulation desk at (847) 214-7337. As soon as your barcode is activated or your card is issued borrowing privileges begin. More information about borrowing privileges can be found on our website. 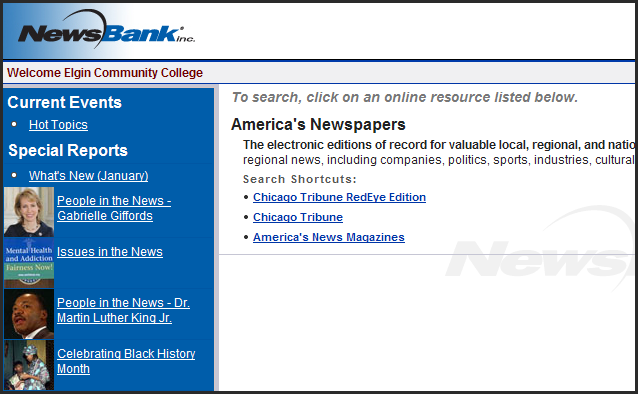 ECC Library has added two new databases this semester: NewsBank and Nature. NewsBank is now your go-to source for the Chicago Tribune. You can even access articles from today’s edition! ECC Library patrons now have access valuable local and national information from the Chicago Tribune through this database instead of ProQuest. Patrons can still use ProQuest to access other newspapers (such as The New York Times and Wallstreet Journal) as well as scholarly journals, magazines, and trade publications. Our other new database is Nature. This database allows ECC patrons electronic access to articles published within the last 4 years of the weekly science journal Nature. 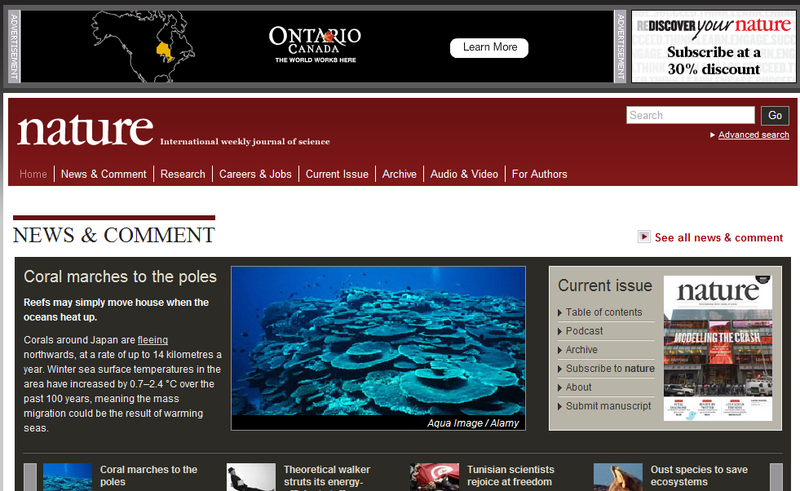 Keep up with the lastest in scientific research! Login for both these databases is required when accessing them from off-campus. Contact the ECC Library for more information on registering your bardcode with the library. 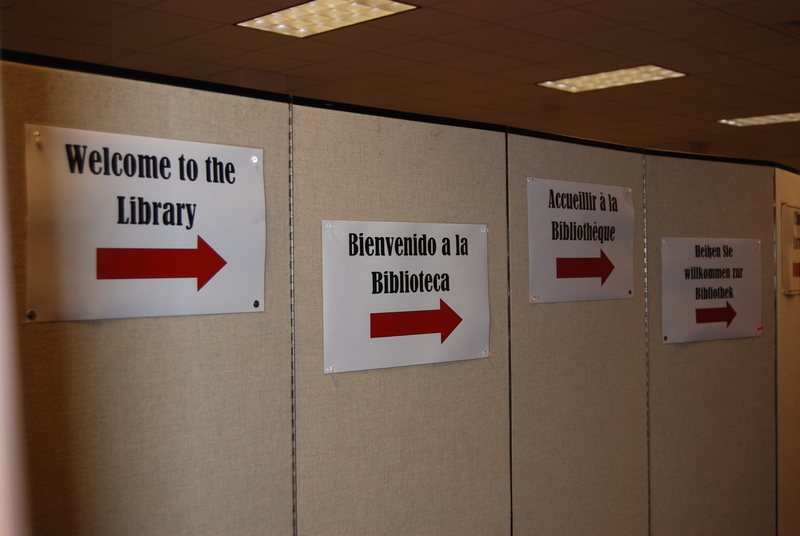 Starting this week, there’s a new option for entering the library. 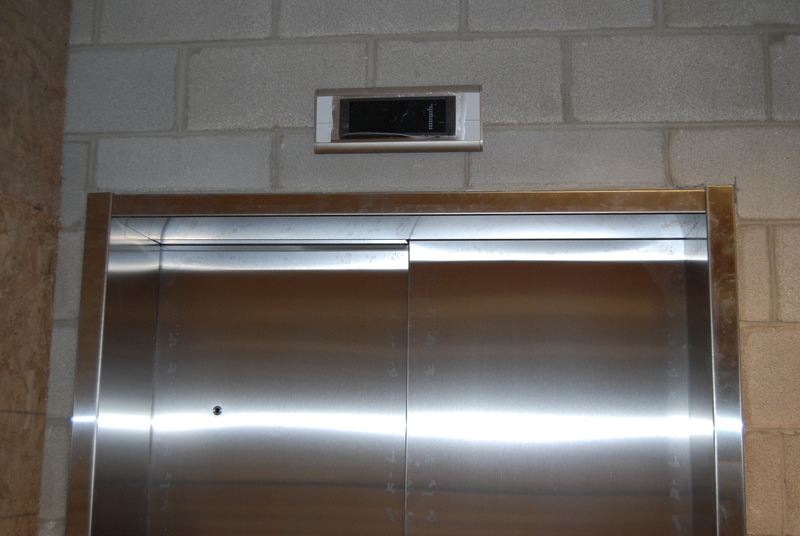 A new elevator opens into the library just beyond the reference desk. Once you exit the elevator, just follow the signs down a short path and through the gate into the library. To use the elevator to exit the library, go out the library exit as you normally would and enter again through the library entrance. Then, instead of going back through the library gate into the library, follow the sign back down the pathway to the elevator. Sound complicated? No worries! You’ll get the hang of it. And if you need help, ask any library staff member and we’ll be happy to direct you.